The story of Warhammer 40k is, and always has been, the story of the Imperium. Until now, however, we have seen only part of it. The alien races add colour and complexity, harrowing the empire of man from its fringes, and of course there is always the great enemy, Chaos, waiting in the wings for mankind’s own hubris to bring him down. The main player, however, remains the Imperium, a toppling edifice of decaying glory and overweening arrogance in the face of a brutal and rapacious assault from within and without. Here we see the fall of Rome written across the stars. It is peopled by the strange and the mysterious and governed by the mad. Together they grub through the ruins of their own toppled magnificence and believe themselves still to be supreme. Their wars are fought by medieval peasants, armed with weapons far beyond their understanding, holding back the horrors of the galaxy only through sacrifice and attrition. It’s infamous ‘grim darkness’ has been captured by dozens of authors and codex writers, as well as artists including, amongst others, John Blanche and Jes Goodwin (whose images are used – without permission – to illustrate this blog). Somehow I’ve never felt that this was quite captured on the tabletop. The warrior-monks of the Space Marines have often looked too clean. The imperial guard have come to focus too heavily on the Cadians (whose aesthetic is closest to modern soldiers and not really to my taste) and the Catachans (who now seem like a contrived pastiche, glaringly out of place beside the gothic strangeness of their peers). The inquisition are spent force. They might once have been at the pinnacle of grim-dark gothic greatness but today they look old, tired and utterly overshadowed by the creative genius displayed within the Inq28 movement, their own feral offspring. The assassins and ecclesiarchy languish in lumpen disregard. 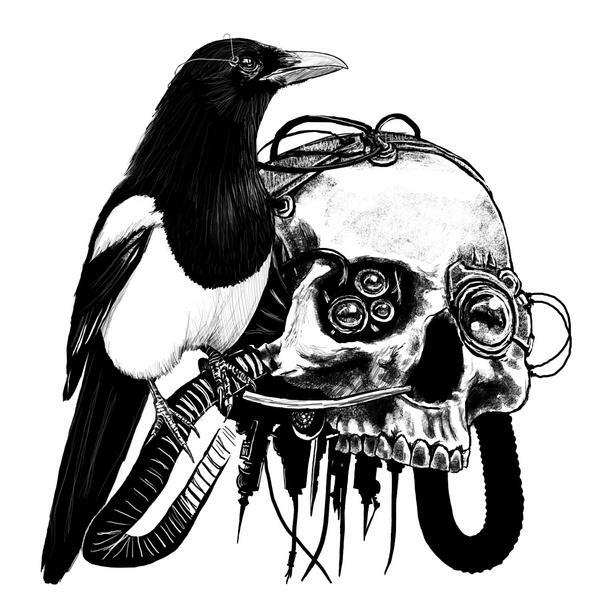 Today however sees the release of the Adeptus Mechanicus. Since the beginning they have been a part of the background but it’s taken until now for them to emerge. Quite why it’s taken so long is open to debate, the Imperium after all is the marriage of Terra and Mars, yet the red planet has seen next to nothing in terms of miniatures releases. Exactly what will come next with this release we don’t know yet, although it’s hard to imagine that more miniatures are not on their way. Already, however, we’ve seen the kind of grubby madness I’ve been hoping for since I discovered 40k. Not only do we see the Mechanicus army so many of us have been waiting for but the spares should provide more than enough to add a Blanchien vibe to other imperial models. Of course I still have a host of Chaos projects to work on before I rush out to buy the agents of the Fabricator General but, having waited for them for so long, it won’t hurt to be patient. At least they’ve arrived. I do love a dreadnaught. Most of the time ‘walkers’ in science-fiction leave me cold. Most likely it’s a result of growing up in Britain but there’s something about a handsome, cultured and well-groomed hero piloting a sleek and stylish mech that I find fairly irritating. More exciting to me by far is a heavily-armed walking life-support machine with all the aerodynamic grace of a perambulatory refrigerator, grimly laying down the law in the name of some neo-medieval Thatcherite hell. Probably in the rain. Add to this the fact that Nurgle and Helbrutes seem to work well in combination. Both tend towards being outsize, lumbering and ugly. Both should by rights be dead but have somehow managed to live on, albeit not in a form that most would actually choose. I even wonder if the resistance to pain with which Nurgle is known to bless his followers make interment in a Helbrute a less miserable experience. As a result one of the first things I wanted to do with the Putrid Blightkings kit was create a Nurgle infested Helbrute. Never mind that I find big kits a bit of a chore to paint, or that I’ve already got two Helbrutes, plus another I need to get some paint on, let’s focus on my avaricious desire to add another! At the moment he’s only tacked together but this should give you some idea of where I’m going with this. I armed him with a missile launcher as I see him trudging along at the back, a bloated, disease-ridden walking shrine to the Plague God, launching salvos of toxic warheads over the putrescent ranks so that the gifts of Nurgle are already well established when they get there. As you can see the back of the model is still slightly sketchy but the picture below shows where I’m headed. Here’s the individual components disassembled. And here’s a close up of the main body. So what do you think? Should I have taken that rash to the apothecary or was I right to bath my ironform in a soup of decay? As always your comments are welcome in the box below. I’ve been promising him for a while but the mighty wrath of Khorne has been distracting me from the servants of his more fecund and jolly brother. However here he is at last – Aghkam Poxspeaker, Dark Apostle of Nurgle. It’s all fairly infantile of course but I can’t help but imagine him belching out the word of Nurgle to a giggling congregation of Nurglings. Of course, one has to wonder how he would go about winning over disgruntled Imperial serfs to his cause like that, but then I’ve often thought being a Dark Apostle of Nurgle can’t be the easiest job to begin with. Chaos offers the strength to overthrow the Imperial yolk, Khorne supremacy in battle, Slaanesh every imaginable pleasure and Tzeentch great magical power, whilst the unfortunate salesman for Nurgle finds himself peddling the line ‘Well, we’ve got some cracking diseases…’ He’s hardly the one you’d pick really, unless of course you were already sick and dying, in which case the wheezing invocations of any daemon would probably be enough to sway you to his cause in exchange for renewed vigour. Then again Nurgle’s an optimistic fellow so perhaps Aghkam doesn’t mind that. He can keep going with his pompous, long-winded and flatulent sermons, safe in the knowledge that as the galaxy succumbs to decay all men will come to him eventually. Well here we go at last! The truly terrible bloodthirster model that has blighted our lives for so many years has finally been shown the door and replaced with a far more magnificent version (see my thoughts below). Driven forwards by the rage of the Blood God (or possibly just old fashioned excitement about all things Khorne) I managed to get this model finished, the first of the Red Wolf’s squad. A little ‘group shot’ of him next to the Redwolf shows just how big the latter actually is. The new addition is by no means small for a Terminator, his size accentuated by his wide pose and bulky shoulderpads, but the Redwolf still towers over him. Already I’m feeling that my decision to promote him to command of his own squad was justified – this guy is nobody’s second! I’ve also been working on this Dark Apostle of Khorne (I know, I’ve not posted pictures of the Nurgle one finished yet – you don’t half nag you know!). Long term I’ve got a plan to make a Dark Apostle for each of the gods, plus the official finecast model (assembled and based coated baby!). For the Khorne Apostle I wanted something reminiscent of a loyalist chaplain with a chaotic twist – capturing what I see as their similar roles and philosophies. Both would spent much of their time in the thick of battle, bellowing devotion to the Emperor or the Blood God respectively, dedicating each kill in their name and spurring on their battle brothers. The Apostles of the other gods, I imagine, spend more time preaching to dissatisfied hive workers, dissidents and the savage tribes of feral worlds – those of Khorne just want to get stuck in. In spite of this I wanted a slightly more restrained pose, capturing him in a moment of contemplation – perhaps preaching to his brothers about the value of weapons or dedicating his flail ahead of combat. I’m thinking of adding some kind of tabard to cover up his rather waspish waist. I’m playing with a couple of options at the moment; a wolf’s pelt (suitable savage and tribal) or chains (harder to pull off and possibly naff looking, but undeniably badass if it comes together). Anyone got any thoughts? 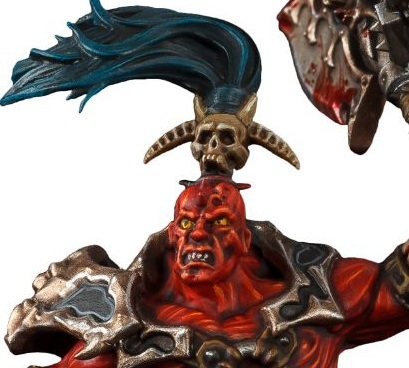 Anyway, as I mentioned all this Khorne enthusiasm has come about as a result of seeing the new Bloodthirster model that went up for pre-order this weekend. And what a model it is. Admittedly a big part of my enthusiasm for it comes from the fact that it is a massive improvement on its predecessor. Given the choice I would have liked to have seen something slightly less dynamic. To my eye a hunched, aggressive pose, charging head-down into battle, would have served better here than leaping into flight, whip curling overhead. Leave the dancing to Slaanesh and the flying to Tzeentch (and of course let Nurgle lumber along at the rear!). Nonetheless these are fairly minor complaints given that a) the Bloodthirster can finally be represented on the tabletop by an official model worthy of the concept and b) other greater daemons might really be around the corner. For Warhammer the original Bloodthirster has now been transformed into three different units. A quick glance through the fiction shows them all to be pretty angry guys which does make me feel a little sorry for the poor soul who was given the thankless task of producing background for them. Coming up with different models, weapon options and rules must have been a doddle compared to coming up with original ideas expanding on the difference between daemons who get angry about slightly different things. 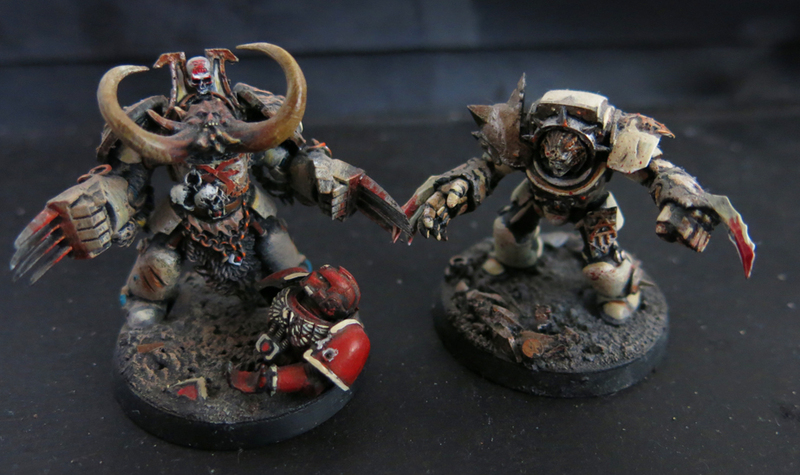 It also appears that Khorne now has a sliding scale of anger he applies to his Bloodthirsters. (This may not be new-news but it’s certainly new to me). Apparently there are eight legions of Bloodthirsters, eight being the sacred number of Khorne, and each is angrier than the last. By my understanding they ascend through Miffed to Mildly Aggrieved, Peeved To Say The Least, Well Pissed Off, Proper Nark On, Kicking Off Big Time and finally Writing to the Editor. As for the model itself I’ll throw in my lot with the majority who’re slavering over it, although – as mentioned above – there are a few things that bother me. For one thing I hate flames on miniatures so they’d have to go for starters – maybe replacing them with some rubble or a big old pile of skulls. I also find the symbols on the wings to be rather busy, we know he’s a daemon of Khorne, there’s no need to beat us around the head with it. No-one is going to think ‘Is this guy Eldar? Check his wings and find out. Oh no, he’s with Khorne’. Perhaps a more subtle paint scheme might make them more acceptable – in face a close look at the Unfettered Fury Bloodthirster in this week’s White Dwarf shows just that. Otherwise I’ll have to see how long it takes with the sandpaper (heart in my mouth all the way in case I knacker the wings). Having said that, somewhat hypocritically, I think the sigils on the underside of the hooves are a cracking touch and the idea of them stamping the mark of Khorne wherever they go is just wonderfully cocky and aggressive. When basing the model I’d like to try stamping out some casts of his foot prints in greenstuff and leaving them in a trail behind him. I’ll be curious to see how poseable the model is, the combination of axe and whip raised high being slightly over-the-top and reminiscent of a caricature anime villain for my taste. Truthfully I prefer the double-handed great axe – it may not be the traditional weapon combination of the Bloodthirsters but it calls for a lot less skill and precision to use. Let the followers of Slaanesh mess around developing the skill to use a weapon in each hand, if Khorne’s warriors can be hitting someone with an axe as big as a tank that should be more than enough to do the job. Plus, as well as being utterly practical and unsubtle, it also looks the business. The question of whether Games Workshop will be bringing rules for this weapon to 40k is still a matter of some conjecture – although frankly it makes good business sense to do so, variety being the spice of life and all that. In terms of conversion potential this model does offer a few other opportunities for the followers of the Blood God. For one thing there’s always Skarbrand – suitable trashing of the wings or replacing them with the tattered wings from a zombie dragon should do the business. Adding the second axe might be a little harder but at least he has two axe heads to begin with so some of the leg work is done for you. The spare weapons and armour plates should be about the right size for Khornate Knight Titans or Soul Grinders and the model also comes with a number of large skulls (funny that) – worth watching out for if you’re planning a tainted chaplain dreadnaught for a Word Bearer’s force. Speaking of the Word Bearers this weekend’s other big release is Forge World’s Mhara Gal Tainted Dreadnought. Having been slightly disappointed by the Gal Vorbak I awaited the Mhara Gal with a degree of trepidation. On first impression though I like it. As a chaos walker it falls at the exact opposite end of the spectrum to the Decimator, the latter being fearsome and functional, the former a twisted amalgam of metal and meat, liberally scrawled with sigils. The official paint job does it no justice at all but all my concerns with the model evaporated when I got a look at the naked resin (those talons bursting through the shoulder pad to hold the book looked pretty rough at first glance but sans paint they’re a lot more impressive). Oh and the head, once I worked out what’s going on, is wonderfully ghastly. I may even buy one (although I’ve already promised myself a Decimator, Blood Slaughterer, Blight Drone and – some day when I’m rich – a Greater Brass Scorpion) so it won’t be for a while. Anyway, with these two big models unleashed, it’s been a good weekend to worship the Ruinous Powers. Now back to work the lot of you!